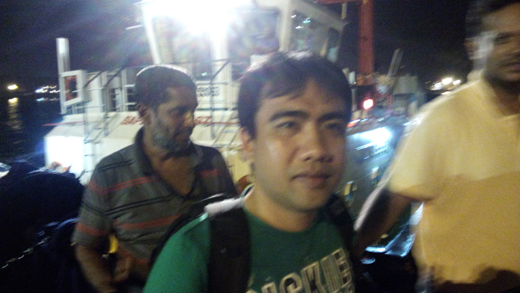 Mangaluru, June 16,2016: Maritime Rescue Sub Centre (MRSC), Mangalore functioning under aegis of Coast Guard Karnataka, has carried out successful evacuation of Mr. Mongan Ryan Frugalidad, 33 yrs old Filipino crew from Motor Vessel Eagle Strait off Mangalore Harbour at 0025 AM on 16 June 2016. At about 0715 PM on 15 June 2016, MV Eagle Strait informed MRSC Mangalore that one of the crew is suffering from minor heart attack and requires immediate evacuation and hospitalization for further treatment. 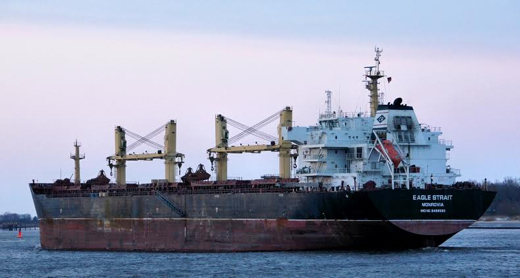 The 186 mtr long bulk carrier, MV Eagle Strait was on her passage from Kwangyang, South Korea to Mundra Port (Gujarat). The sea conditions are rough due to the ongoing Monsoon and the evacuation task was challenging due to the night hours. On receipt of the message, MRSC Mangalore swung into speedy action and directed Indian Coast Guard Ship Rajdoot, patrolling in the area, to render assistance. The merchant vessel was escorted to New Mangalore Port Trust (NMPT) anchorage by the Coast Guard Ship. With the assistance of local agent and NMPT Tug, the patient was successfully evacuated at 0025 AM and admitted at AJ Hospital at Mangalore. Presently condition of the crew is reported to be stable. The prompt response by all the concerned agencies involved was well appreciated by Deputy Inspector General KR Suresh, TM, the Commander Coast Guard Karnataka. He requested all agencies to be available and alert 24 X 7 during monsoon period for providing timely maritime search and rescue assistance since the time is critical and of essence in saving lives at sea.